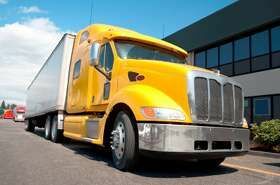 Hi reading into their program for the cdl, how is the class they do and how is the company? Their trucks are pretty much as you have read. They have EPUs (giant battery pack), inverters you will have to buy and when you are in for maintenance have it installed. I know they have international pro stars and Freightliner cascadias in their fleet. Red trucks for the dry van division. I have seen both red and grey hauling flatbed. Grey is their special division trucks. Will either be flatbed or reefer.